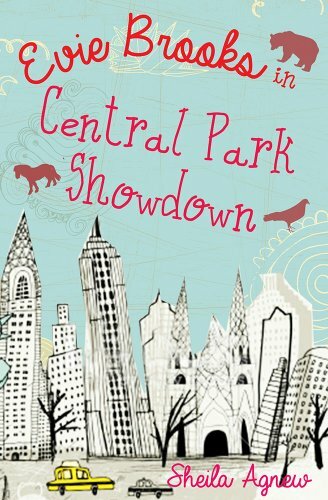 Central Park Showdown is the second outing for Evie Brooks, and follows Marooned in Manhattan, published earlier this year and enthusiastically reviewed in Books for Keeps. This new adventure takes up where Marooned in Manhattan left off: things seem to be sorted for Evie, very happily settled in New York with her uncle Scott, the ultra-eligible vet. But then, out of the blue, her father turns up and requests custody. Evie has never met her father and resents him for leaving her mother. She wants nothing to do with him, nor does Scott, and everything is placed in the hands of lawyers and child psychologists, as eccentric, and sharply described bunch of New Yorkers as you’re likely to come across in fiction. With the court process trundling on in the background, Evie’s day to day life carries on, at least on the surface. Despite the distractions of her new school, a sort-of boyfriend, and various sick animals – Scott’s now consultant vet to the Central Park Zoo so these include a depressed Red Panda, and pregnant Alpaca – the uncertainty of her future is a constant worry. Evie remains a convincing and extremely appealing central character, and Sheila Agnew gets her teen voice just right. The book is a page turner alright, with never a dull moment let alone chapter, and not since My Family and Other Animals has a chorus of four-legged creatures provided such opportunities for humour or for insight into the relevant human’s condition. Underneath the action there are real emotions being explored: the showdown, when it comes, is proper Big Apple style and suitably dramatic, but it’s the quieter resolution – when Evie of her own accord decides to make contact with her father – that leaves the lasting impact. Evie still has more to find out about her mum, and herself, and there should be more Evie Brooks books to come. I’ll be looking forward to them.